Team Canada recovered from a final round robin draw 1-4 defeat by Switzerland to take the 2nd Annual Kinross International. Their second place in Pool A led to a 4-2 semi-final win over USA. They then faced Germany who beat Switzerland 7-4 in the other semi-final. In the final Canada beat Germany 5-2 and USA took bronze with a 5-3 win over Switzerland. Great Britain, winners last weekend in Norway, lost to both USA and Germany and failed to reach the playoffs. For full results CLICK HERE. Quebec's Lennoxville CC, who made great strides in producing a competitive team by recruiting established athletes from opther sporting disciplines, suffered a severe blow when their skip, Ben Lessard, suffered a serious accident while competing at water-skiing in France. Despite that setback they will have two teams on the ice for the club's season opening bonspiel this evening. Lennoxville is hosting an Open House on Sunday October 25th and have invited three Quebec City coaches to observe, as well as Quebec Provincial Coach Alan Smith who may film the curler's deliveries. There will also be a clinic the weekend of October 31 - November 1st and the club will be sending at least one team to the Cathy Kerr Spiel in Ottawa at the end of November. 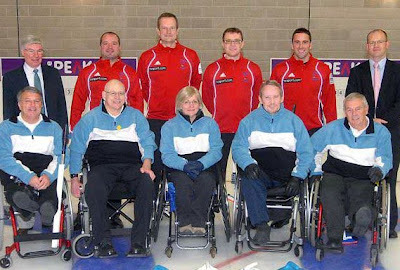 Canada won against Scotland (7-0) and Norway (7-4) on the opening day of the Kinross International. "We played well and were pretty much in control of both games," said Jim Armstrong. "Last year they had shaved the rocks, and there was a huge amount of late swing, but this year it's a great surface and the rocks have had a year to bed in, so we're getting a very manageable 2-3 feet of swing on draws. "Great Britain struggled a bit today but they are throwing with a lot more confidence than at the Worlds. I think they have been practicing all summer and it shows. Sweden are also playing exceptionally well under Tomas Nordin, and i have been impressed with Norway's new coach, Per Christensen. Canada have a big target on our backs, and that's all good. "At the moment we are thinking that we will keep our front end and our back end together, so Bruno will fill in for anyone unable to play, rather than reconfigure the whole team. Darryl will sit out our final round robin game against Switzerland to give Bruno some ice time." Jim Armstrong skipped and threw 4th stones throughout the recent Norwegian Open, and told me this evening that the spiel was a frustrating experience. "There was a last minute change of venue which meant we had a four hour bus ride each day. Then our two losses were directly influenced by the time keeping. We were two up against USA after 6 ends, when the bell rang; but we played the 7th end and gave up 3. Then against Scotland, we were one down after 5 ends when the bell rang, but though we began the 6th with the hammer, we were told to come off the ice. Two games, two different rules." Armstrong, who sounded quite weary over the phone, said that he would probably sit out at least one of their 3 round robin matches in Kinross. Nine teams are competing over three days, with the semi-final and final set for Thursday. The 2nd Kinross International begins today with nine teams in two pools. Canada, Switzerland, Norway and Scotland 1 in pool A. USA, Germany, GB and Scotland 2 and 3 in Pool B. Click link for the event schedule DOC or PDF. Results will hopefully follow. Games are scheduled for 8 ends, but will finish at the end completed at or after the bell. Great Britain are coming off a convincing win in Oslo where they went undefeated to pull away from a strong international field. They have persevered with their near t-line delivery, and that additional width may have made a difference on European ice that is generally a lot straighter than the 4-6 feet of movement expected in Vancouver. The fire marshals shut down the brand new Halden Curling Centre last Monday, necessitating a change of venue for the 3-day Norwegian Open that began today. The event was moved a two hour drive from the hotel away to the Snarøya CC in Oslo, home of Dordi Nordby. Canada was scheduled to play Scotland, USA and one of the Norway teams today but results are not yet available. I did however have the opportunity to speak with Thoralf Hognestad, who coached Team Norway for three years and a double World Championship before handing over to Per Christensen this summer. Thoralf has long argued that Norway's success was down to their understanding of the different demands of the wheelchair game. (He put their struggles at the 2009 Worlds down to lack of ice for training, though they did beat Canada.) He feels the team that will win in Vancouver next March will be the team with the highest percentage on takeouts. "It's a hitting game, especially on European straight ice," he said. "It's harder to hit on Canadian ice that swings 6 feet, but I think the team with the best hitting game will win." Does Norway have that potential? "They have the potential," he said, "but it is open. Canada won last March because of Jim Armstrong's ability at skip. He understood a lot more about the wheelchair game than when we first played him in Europe." Hognestad was dubious of Korea's chances, though they bring with them a reputation as a big-hitting team. "They were a little fortunate to reach the final in 2008," he said, "and I don't think they have improved much over the last few years. Korea and China both play a draw, draw, draw and wait and see what happens style, and I don't think that will be enough to win. 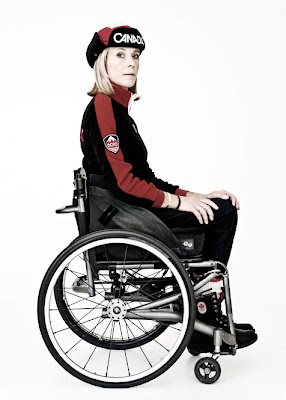 Canada has a big advantage at skip but I think the Paralympic competition is open." I hope to have news and results from Oslo later this weekend. Terrace CC is the latest BC club to welcome wheelchair users. Canadian champions Frank LaBounty and Whitney Warren were at the club last week to assist with a give-it-a-go session. Read the Terrace Standard's article for more information. Elsewhere, the Nanaimo CC is installing an elevator to allow wheelchair users full use of their facility, including the bar. Wheelchair curling will commence on completion of the project, anticipated to be the end of November. There's a move to widen the appeal of 2-on-2 curling by removing the requirement to use sticks. What a obvious and wonderful idea! The 2-on-2 format has just as much appeal to curlers able to use a slide delivery as those forced to use a stick, and fears that stick users would be unable to compete with sliders have been shown to be unwarranted. Sticks have been banned from major competitions as they (may) offer competitive advantage. 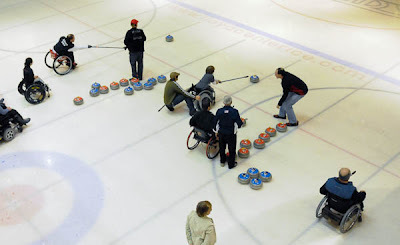 2-on-2 curling addresses many of the objections voiced by newcomers to wheelchair curling: too much dead time and not enough to do. Removing the insistence on sticks opens the game and will mean more opportunities for wheelchair users to compete. Visit sturling.net for more information. Every now and then a thought occurs that's not substantial enough to warrant a full blog post, and Twitter is the perfect forum. For example today's Vernon Morning Star had a very nice photo of Team Canada lead Sonja Gaudet, as well as a couple of quotes on how she likes the new uniforms. Unfortunately she was not modeling them in the photo, which rehashed the CCA's team announcement, and promoted Ina Forrest to Torino Paralympian. A pretty poor piece of uncredited journalism that added little to what has already been covered here, but Twitter gave me an excuse to link to the photo. You'll find it on the WheelChairCurl Twitter account so follow us there. 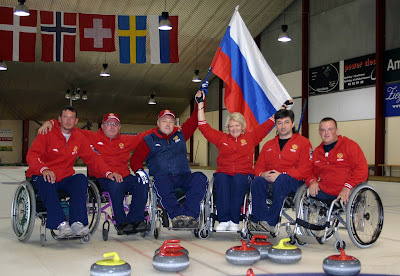 The German Paralympic team makes just one change from the five that led after the round robin and then snatched bronze with the tournament's miracle shot at the 2009 Worlds (view below). Jens Jäger skips, with Marcus Sieger at 3rd, Jens Gäbel at 2nd and Caren Totzauer at lead. All are from the Schwenningen Curling Club. Christiane Steger from the Füssen Curling Club replaces Astrid Hoer who has stopped curling because of health reasons. The team's next competition will be Kinross, October 20-22. Jens Jäger has his own website (in German) which reflects the spirit and energy he and the team's supporters brought to the empty bleachers at the 2009 Worlds, though their lusty renditions of the team's song may be harder to hear this coming March. Here again are the final two shots of the 2009 Worlds bronze medal game between USA and Germany, with USA throwing the yellow rocks and seemingly certain of victory. 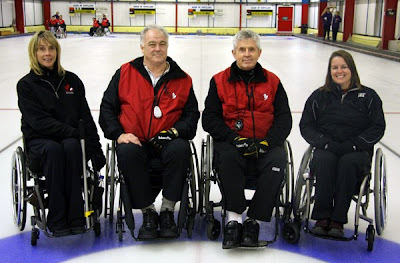 The CCA has finally officially announced Canada's 2010 Paralympics team, fortunately unchanged from our earlier post. CEO Greg Stremlaw sends his personal congratulations to the team and Team Leader Wendy Morgan says: "This has been a three-year journey in a comprehensive selection process. It has been a difficult process at times, as it is not exclusively a skill-based decision but encompasses team dynamics, peer assessment, performance in competition and positional aptitude." Which is a tacit acknowledgment that however diligently statistics are compiled, and they were, in the end selection is made on the coach's and in Canada's (special) case the skip's gut feelings about which combination of individuals are most likely to produce a gold medal. Curling writer Bob Weeks is pleased to see Jim Armstrong at the helm and shares a memory of Jim at a Brier. Team Canada skip Jim Armstrong is getting back on the ice as he rehabs the surgically repaired shoulder that was further stressed in a car crash. "The accident probably set me back a couple of weeks physically, though of course there has been a lot of family stuff as well. "We had a wonderful celebration of (late wife) Carleen's life ten days ago," he told me this morning just before leaving for practice at the Richmond CC. "And yesterday 106 people were part of Team Momma Armstrong at the CIBC Run For The Cure. It took several of them, but they pushed me round the whole course. "Now I am doing lots of physio to get the shoulder fit, and beginning to throw some stones. 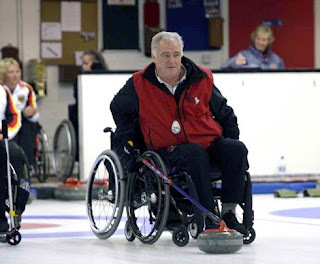 I'm thankful to have wheelchair curling to concentrate on after all that has happened this summer. "I'll be traveling with the team to Norway and Scotland, probably to provide some comic relief. Everyone has been very supportive and understanding that I haven't been able to participate very often in the training camps. I am really impressed with how the team has come together. If you had asked me a year ago whether a selected team could work together as well as this one does, I would have been skeptical. But I think our team spirit will be one of our advantages next March." 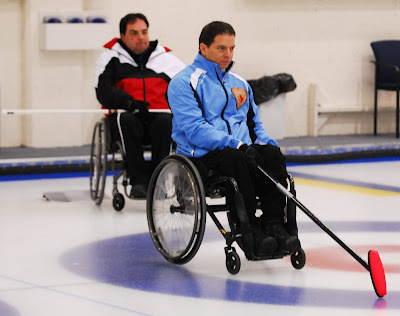 Asked his reaction to Sweden coach Tomas Nordin's initial impression that the wheelchair game was very similar to regular curling, Armstrong said: "Tomas is a great curler and very experienced and will do well. But my understanding of the wheelchair game has been a lengthy learning curve and it takes time to appreciate the nuances. Not having the big weight to clean up trouble has to be taken into account, although I suspect that in the future the top teams will develop the ability to throw the 7 or 8 second takeout accurately." Team Canada will be competing in Norway's Halden International October 16-18 and then Scotland's Kinross International October 20-22. 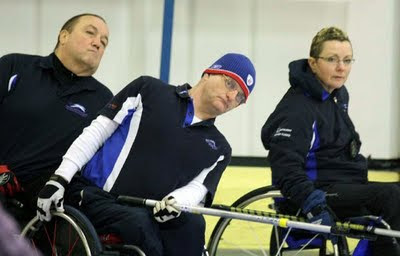 Bob Cowan photographed four members of the Great Britain Paralympic team competing at the Dewar's Rink in the Wednesday Perth Super League. It's an excellent opportunity to practice the game calling skills they'll need to beat Jim Armstrong's Team Canada. While the GB team has been set, it has not been finally decided who will skip. There is some talk among Scots supporters that though Michael McCreadie played 3rd to Frank Duffy during the period that Scotland were World Champions, he might not have the temperament best suited to skipping and throwing 4th stones. His partner and team mate Aileen Nielson, has had experience at skip and newly returned Angie Malone has also had success skipping her domestic team. Front: L-R: Ian Donaldson, Jim Taylor, Angie Malone, Jim Elliott, Bill Masterton. Back: David Hird, Euan Byers, Peter Smith, Graeme Connal, David Murdoch, Andrew Bain. At the beginning of September Scot Jim Taylor challenged World Champion David Murdoch to a game at Stirling to raise funds for the Marie Curie Big Build Hospice Appeal. The event was organised by Give Them a Sporting Chance, which is a registered charity giving carers and those with disabilities, of all ages, the opportunity to make their sporting or recreational dreams come true. 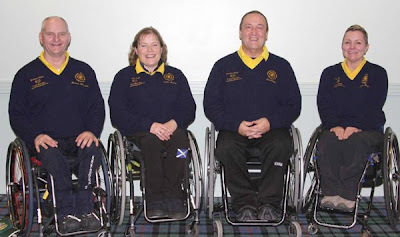 For more information on wheelchair curling, please contact Logan Gray at Active Stirling on 01786 432323. Nine teams are competing at the Kinross Ice Rink this weekend for the British Open title. A two pool round robin will conclude with a semi-final and final on Sunday. Click here for the draw. 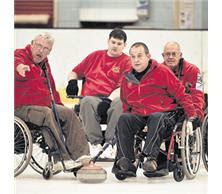 The North Wales Pioneer reports that the Welsh wheelchair curling program's ambitions to compete in the upcoming British Open and international events have come to an abrupt halt with the unavailability of their lone female curler. The Deeside Ice Rink based program began six years ago. Team member Peter Knapper explained: “We’d be going to the British open as well as world championship qualifiers – these could be in Prague, Vancouver, they could be anywhere. “I don’t know why we have such a problem getting female members but we have to have a mixed team to play in the internationals. “I’ve played in two world championships – the first was in Switzerland and the second was in Glasgow – and a couple of British opens but it’s difficult because of lack of practice – we can only have this rink on a Monday, 6pm to 10pm." The team is specifically looking for female members but anyone interested in trying it out should contact team coach John Stone on 01244 810673 or team member Allan Young on 07516479053. Lack of female participants is one of the reasons competitive wheelchair curling has struggled to establish itself as a winter recreation. National championships and international events are run under WCF rules that mandate mixed gender teams, despite far fewer than 25% of active wheelchair users being female.